So, to get this great bird the attention it deserves, we’ve reserved the July 2015 spot in our 12 Months of Birding at the Inn blog series. I mean, how can you miss a bird with pink legs? And back to that call of theirs: similar to a Vireo, the Ovenbird does not care if the afternoon gets warm; it’s going to sing, sing, sing. So it might be one of the few birds that you hear in the mid-afternoon on a hot summer day (hot for us being about 84 degrees). 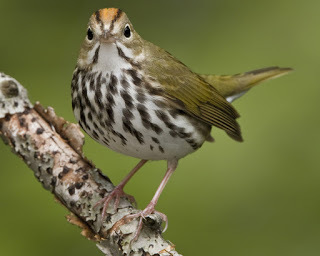 The best places to spot the Ovenbird at the Inn on Mill Creek B&B are the wooded border behind our apple orchard, in the brush that borders the north lawn, and in the woods at the south end of the property near the picnic table and the small stream. Don’t just look up to the trees, either. 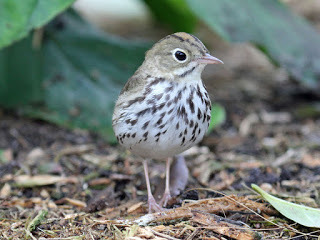 Ovenbirds like to scoot along the forest floor foraging for insects. The Cornell Lab of Ornithology calls the Ovenbird’s stroll, “herky jerky”. So just watch for an olive-green bird with a dark-spotted chest and pink legs strutting around like Mick Jagger. Really, how does this bird not get more attention? This entry was posted in Birding in the North Carolina Mountains and tagged 12 Months of Birding at the Inn, birding, Summer by Inn on Mill Creek. Bookmark the permalink.